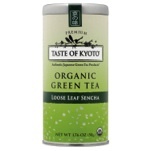 Taste of Kyoto’e exclusive line of matcha and sencha products are made with only the highest quality, organic japanese green tea. One of our favorite things about Kyoto is the variety and quality of sweets made with Matcha tea powder. 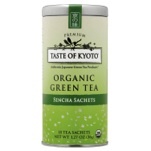 While Matcha green tea is traditionally used used for tea ceremonies, it offers a distinctive yet complex flavor that can be enjoyed in a variety of sweets and baked goods. 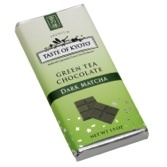 We have combined exceptional quality Matcha green tea with white chocolate to create a convenient and enjoyable treat. 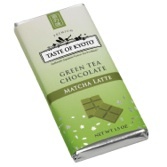 Our Matcha Latte Chocolate is a creamy, indulgent treat that combines exceptional quality Belgium white chocolate with a hint of Japanese Matcha green tea. INGREDIENTS: Belgian White Chocolate, Organic Japanese Green Tea. Matcha is a traditional Japanese ceremonial tea created by milling specially grown, whole tea leaves into a fine powder. 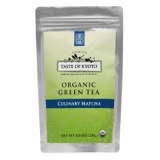 Matcha contains powerful anti-oxidants that are thought to help maintain optimal health. 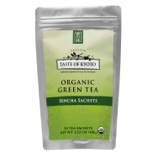 Sencha is the traditional, whole leaf green tea enjoyed daily in Japan. 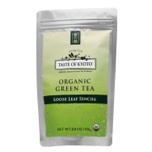 Our tea is cultivated by multi-generational, family operated tea growers who practice healthy organic farming techniques. Full of powerful antioxidants that are believed to help prevent cancer and lower cholesterol, our Sencha also contains L-Theanine which is an amino acid thought to help promote a relaxed state of wellness. LID-LESS JAPANESE TEAPOT: This innovative and functional lid-less teapot has a wide entrance and an integrated strainer to make tea brewing and cleaning easy and hassle-free. The world renowned Tokoname-Yaki offers high quality and sleek design. Available in either matte black or matte white. Taste of Kyoto has created unique gift sets perfect for green tea enthusiasts. SENCHA GIFT SET*: Includes our premium 100% organic japanese Loose Leaf Sencha and two signature Matcha Green Tea Chocolates (Dark Matcha and Matcha Latte). 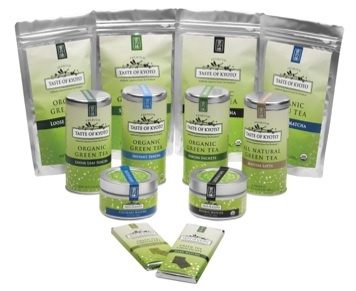 GREEN TEA ASSORTMENT GIFT SET*: Includes our ultra premium organic Sencha Loose Leaf Green Tea, organic Instant Sencha Green Tea Powder and two signature Matcha Green Tea Chocolates (Dark Matcha and Matcha Latte). 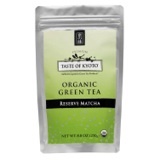 ORGANIC MATCHA GREEN TEA GIFT SET*: Includes our ultra premium organic Reserve Matcha Green Tea, bamboo tea whisk, bamboo spoon for Matcha, one signature Dark Matcha Green Tea Chocolate bar. ©TASTE OF KYOTO. ALL RIGHTS RESERVED.